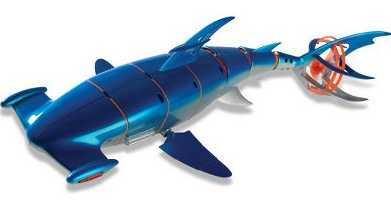 Artificial shark fins to scare is now an old trick which everyone is familiar with, even after seeing the famous movie like “The Jaws” but this Remote Controlled Robotic Hammerhead Shark is the best robotic gadget with extra ordinary reality nowadays you can use to give your friends a heart attack. 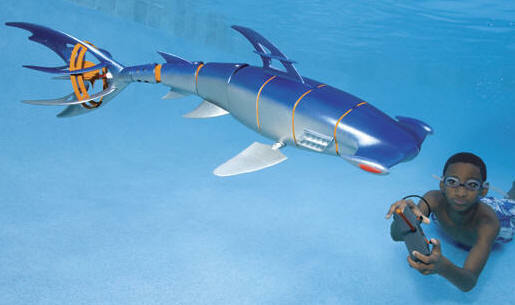 This unique and sleek swimming robotic shark is the replica of a real hammerhead shark and with its full-range motion, it looks as if a real hammerhead shark is on the loose. Being one of the most efficient predators, hammerhead sharks are famous for their shape and this is what which makes this robotic shark different from other ones. It moves with such authenticity that you will be surprised to see that this predator can be controlled with its handheld submersible remote unit through which, you can move the shark to every direction you want and even make it swim backwards too. This shark can swim up to 40 feet in a depth upto 9 feet for full 15 minutes and for this movement it requires initial battery charge of 4 hours and there on one hour subsequent recharging. The remote runs on one 9-volt battery. If you want, you can also use multiple sharks at one time as each colored shark has its specific frequency. All the kids from ages eight and above can control. You can get this for $99.95 and give your children a pleasant surprise. You should be worrying less that it meets all US Federal Toy safety Standard. You can see many more cool Gadgets like The Snowman Robot and Boba Fett cool toy to surprise yourself or whom you are gifting.